Why are the items in my cart full price when it is showing a discount on the product page? Sometimes the website can be running maintenance in the background overnight which could be affecting the sale prices in the checkout. Please try your shopping cart again in an hour or so and it should be back to normal. If you are still experiencing pricing issues after the hour wait, please send a screenshot of the error and details to customercare@lipstikshoes.com.au and we can assist you further. During a sale period, we may experience high demand which can result in issues with checking out. If you do see an error message please refresh the page or contact your financial institution to check if you have adequate funds available. If the issue persists, please send a screenshot of the error to customercare@lipstikshoes.com.au and we can assist you further. Please enter your coupon code on the checkout page where you enter your payment details and click ‘apply’. When your code had been accepted the order total will display the updated amount on the right-hand side. My coupon code isn't working, what do I do next? Please check that the coupon code has not expired and that you are spelling it correctly. If you are still experiencing issues please contact customer care with your code, a brief description of what is happening and a screenshot. Why am I seeing a maintenance message? Due to high demand, our site may be temporarily unavailable during a sale period and you may see a maintenance message displayed on your page. Please send a screenshot of the message to customercare@lipstikshoes.com.au and we can assist you further. What happens if I entered the wrong details when I created my order? As we endeavour to process your order as soon as possible, it may only be possible to amend your details within a few hours of placing your order. Please contact customercare@lipstikshoes.com.au or 1800 976 484 as soon as possible with your tax invoice number and details to update. We aim to dispatch all orders from our warehouse within 5-7 working days. Please note that there can be longer delays during busy sale periods. As such, please allow up to 14 working days for dispatch from our warehouse during this time. Unfortunately, we are unable to dispatch or deliver orders on Victorian public holidays, which may result in further delays. Estimated delivery times are to be used as a guide only and commence from the date of dispatch. For domestic delivery times, please click here. These are to be used as a guide only and commence from the date of dispatch. Please refer to our size chart for further information on sizing. If you are in between two sizes we recommend going up. What size shoe is the heel height measured on? Heel heights listed on the Lipstik website are taken from a size 6 shoe. As the shoe size goes up, so does the heel height. Please take this into account when you are purchasing other sizes. Order confirmation emails are sent out as soon as your order is placed on the website. We suggest checking your junk mail folder for the email and adding Lipstik to your safe senders list for future emails. If you can confirm that you have received a charge within your financial institution please contact customercare@lipstikshoes.com.au for a copy of your order details. Alternatively, please sign into your Lipstik account to view your order history. Once you have placed your order online you will receive an email to confirm your order has been received and your payment has been processed. If you do not receive a confirmation email within 24 hours of placing your order please contact customercare@lipstikshoes.com.au or 1800 976 484 (Monday-Friday, 8.30am-5pm AEDT). I’ve clicked ‘SECURELY PLACE ORDER’ but nothing is happening, what do I do next? We recommend waiting at least 30 seconds to 1 minute for the payment to process. If you have waited more than a couple of minutes and no payment has been taken from your financial institution and you have not received a confirmation, please try the checkout process again. Can I cancel or make amendments to my order? Our business hours are 8.30am-5pm Monday to Friday AEDT. If you need to amend or cancel your order, you will need to contact customer care no more than 24 hours after placing your order. If your order was placed outside of business hours, please contact us first thing on the following business day. Where possible, we will do our best to amend your order prior to being dispatched. What do I do if I have not received the correct item? Please contact customer care so that we can arrange a free of charge return on the incorrect item(s). You will need to complete and include the Lipstik returns form you received with your purchase (or download a copy here), clearly stating your name, the item you originally ordered and the item you received. Can I use my in-store gift voucher online? Gift vouchers are only available for use in-store and cannot be redeemed online. I saw an item marked down in the store - why can't I find it online? Most items marked down on lipstikshoes.com.au can be purchased on windsorsmithoutlet.com.au. Yes we accept Afterpay payments. Please refer to the Afterpay section for further details. We accept Mastercard, Visa, Amex, PayPal and Afterpay. Yes. All payments made via the Lipstik website are processed through Braintree. This is to protect your details as they can only be read on the secure server. Security checks are completed for online transactions to ensure the authenticity of credit card payments and protect you from fraud. If your order has been successful, you will receive an order confirmation email with your invoice within the first 24 hours of placing your order. This invoice will be sent to the email address provided during the checkout process. If you do not receive this email, please contact us immediately. Please ensure you have checked your junk mail folder prior to contacting us. Do you ship to PO BOXES/Parcel Lockers? We do not ship to PO BOXES or Parcel Lockers nationwide. Please address your parcel to a street location where someone will be present between 9am-5pm (Monday-Friday) to accept and sign for the delivery. Orders may take up to 5-7 working days to be dispatched. During peak sale times such as Boxing Day, this may take up to 14 working days. International orders will be dispatched approximately 5-7 working days after your order has been placed. Most orders should be delivered within 3-7 working days unless delays occur via customs. Why did I only receive one item? All items ordered through the Lipstik website will be dispatched separately if you have ordered more than one. You will receive an email with tracking details for every parcel that has left the warehouse. Alternatively, you can view your tracking details in your Lipstik account. How will I know if my item has been dispatched? You will receive an automated tracking number via email only once your order is dispatched. It will be sent to the email address provided when placing your order. Once you have received your tracking number you can track your parcel via Couriers Please or StarTrack websites. Your parcel needs to be signed for as it cannot be left unattended. Alternatively, if no one is available your parcel will be re-directed to the nearest POP location, newsagency or post office. Our courier company will leave a notification card to inform you. Do you deliver to military bases or ships? We are able to deliver to military bases and ships within Australia only. Can I exchange/refund shoes I purchased online? Yes. 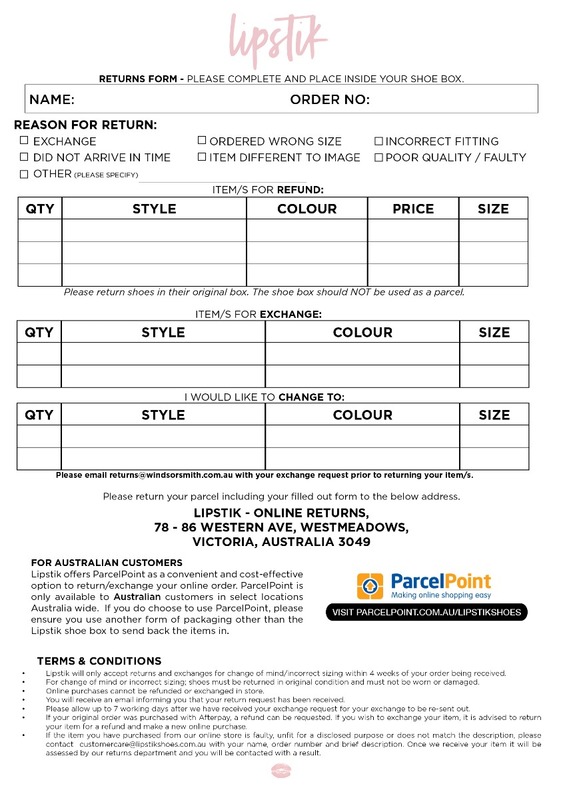 If you receive your order and you wish to exchange/refund an item, you must post your shoes back to head office with a completed returns form which is included in your original order. Shoes being returned need to be in a new and unworn condition, in the original box. We advise our customers to use a postal service that can be tracked when sending their shoes back to head office. Customers will receive an email notifying them that head office have received the returned items. Once it has been received at head office, the returns department will process an exchange/refund if approved. Customers will receive a tracking number once their exchange has been dispatched. Refunds can take up to 10 working days to be processed. The money will be refunded via the original payment method used on the original purchase. How long do exchanges take to be processed? Once we receive your returned shoes, it can take up to 7 working days to process and dispatch your exchange. With any order, we aim to make this process as quick as possible. If you have an item that may be faulty please contact customercare@lipstikshoes.com.au with your proof of purchase, a brief description of what has happened and an image of the product for further review. If I buy shoes online, can I exchange these in store? Our online store and physical stores are treated separately, therefore all online purchases must be returned to the online store. All shoes purchased online must be posted back to head office in accordance with the returns form that is inside the box. Under no circumstance will shoes purchased online be accepted at any of our Windsor Smith / Lipstik stores or stockists for an exchange or refund. We recommend you get a tracking number when you post the shoes back to head office. This is to protect customers by ensuring that the shoes are received and not misplaced. For more information on returns and exchanges, please vist the returns and exchanges page. I saw some Lipstik shoes in a shop but I can't remember where, what should I do? Did you know that Windsor Smith shoes is our sister brand? There's a chance you could have seen a range of Lipstik Shoes in selected Windsor Smith stores. You can view a list of Lipstik stockists here.